You've never had a REAL pastrami sandwich until you have had a NYC pastrami sandwich on fresh NY Jewish rye bread with spicy brown mustard. 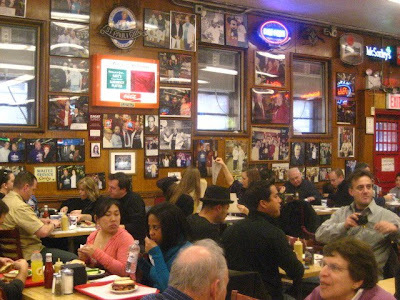 I have had many in my lifetime, however, my favorite is from Katz's Deli on the Lower East Side of Manhattan. I hadn't been to this monster deli since I was a kid. The place is PACKED. LOUD. You can't enter or exit without that little green ticket. There's a security guard at the door. What is he guarding? the pastrami? 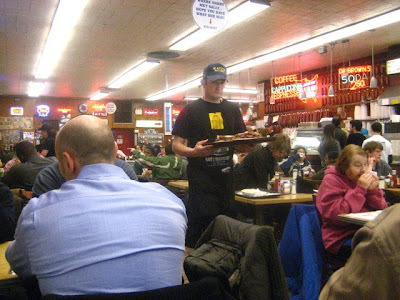 The place has been a landmark on the lower east side since 1888, opened by a Russian immigrant. Check out their website for some cool deli history. 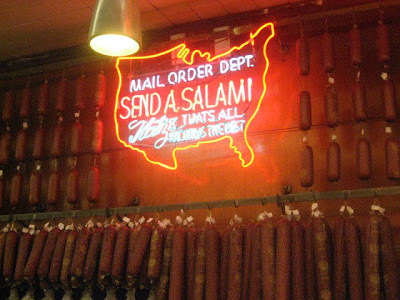 Their motto has always been: "Send a Salami to Your Boy in the ARMY"
We had lunch there during the week and it hasn't changed a bit. The pastrami was just so perfect, a little bit of gristle, a lot a bit of flavor and nice black edges. Sliced medium thickness, the way I like it, with a kosher dill pickle on the side & a swipe of mustard please. Price: $14.95, and yes, I can eat the whole sandwich myself, no problem. 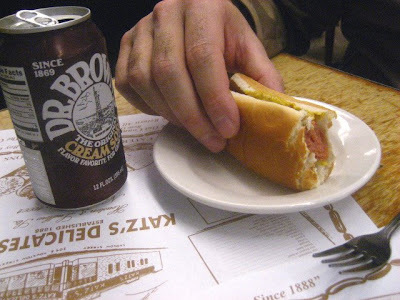 The husband had a beef hot dog with skin on it and a Dr. Brown's cream soda. A great place to visit, even if it was filled with all tourists, who cares? The salami department alone is worth the trip downtown! Every time my mom comes to visit, this is the only place she absolutely insists upon going. You just can't get any better. Although I totally curse it the next morning when I'm so swollen I can't get my rings off. ooo, we'll have to visit this deli when we're in New York next time. We do have a Jewish deli near us in Virginia that we like but we always get their reuben sandwich which is really good there. mmm nice! 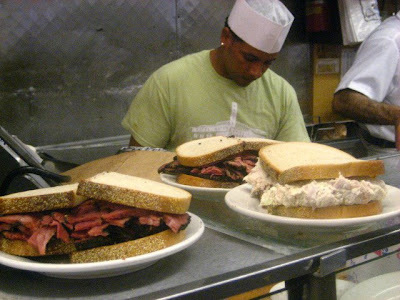 Nothing like a real corned beef or pastrami sandwich. It's near impossible to find elsewhere in the country. I usually end up going to Ben's since it close to where I work, but carnegie deli is my fave. 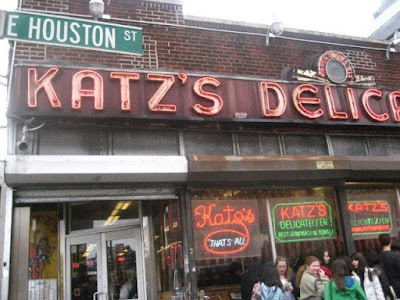 Sounds like you prefer katz's to 2nd avenue deli. This will definitly be on my "bucket food list"!! Wow! I love those dark edges, yumm! Wow, those are some big sandwiches!! It has been eons since I've been there but it looks like nothing has changed! What I wouldn't do for a bite. Pastrami is one of my favorite things in the world. I've been dying to get to NYC to get some, but it's never happened. Some day... heh. 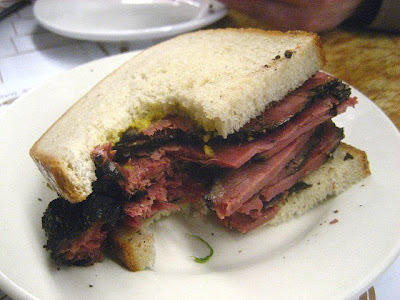 Now that's a sandwich - I love pastrami on rye. You lucky girl. oh good lord... does this post make me hungry!!! OMG Stacey that looks so good! I've always wanted to go to New York for 2 reasons: to shop and to try a real NY Jewish Deli!!! That pastrami sandwich looks yummy! How funny about the security guard and the little green tickets! Stopped by to look up your turkey pot pie recipe! Long time no see! :) Hope you're well! i can't believe i live 15 minutes by subway to katz's and the only times i ever ate there was when i was a tourist with my family. i've gotta get back there before it becomes a starbucks or a marc jacobs store. Touristy pffft it's good! Man, I could go for one of those right now. YUM.